Serial Bluetooth Adapters – Wireless PC Based Robotics! Combine any one of these with a Serial device such as the SSC-32 Servo controller, Step1 Stepper Motor Controller, or a Sabertooth DC Motor Controller and viola! You have a wireless PC based Robot! 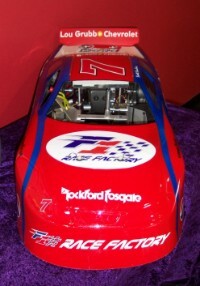 MiniFASTCAR is a company that allows people to race 1/4 scale R/C cars in a virtual reality envirionment. MiniFASTCAR lets you drive a real car on a real track from the safety of a remote driving station. An in-car camera gives you a live-action video feed as you drive the car. A wireless lan computer in the car ensures you have precise control. MiniFASTCARs are real quarter-scale, gas-powered cars, 48â€? long by 12â€? high by 18â€? wide. 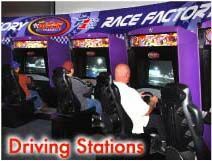 Racers sit at driving stations with steering, throttle, and brake. An in-car microphone gives real engine feedback so the driver is aware of RPM and other race noises. The live video feed is displayed on a high-definition monitor. In addition, a timing and scoring system tracks lap times, car rankings and other statistics so each racer receives a copy of the results at the end of the heat. MiniFASTCARs are raced on oval tracks that may be banked. Most racers find this to be more of a challenge than they expect. Bumper walls keep the cars on the track. The track is roughly 170′ long and 100′ wide. There is a start/finish line and a pit lane for change overs. Rumble strips discourage drivers from cutting corners. A tall antenna in the center of the track feeds video information from the cars to the driving stations. When a car wrecks, the Track Marshall stops the field; simply turns the car down the track; and restarts the race. Damage is typically minimal and since no one is physically in the car, even a roll-over is simply a matter of turning the car right-side up– and the race is on! The technology behind these cars was built by Robotics Group.